Fan-tailed guppies -- also known as fantail or fancy guppies -- get their name from their fan-shaped tails. They come in all colors of the rainbow and many varieties. The most desirable fantail guppies have tails that are as wide as they are long. Like other guppies, they are hardy and easy to care for. A plentiful fish, fantail guppies are not expensive -- usually they can be purchased for $1 to $2 each. Sometimes they are sold as a trio -- one male and two females -- for up to $20, especially if you are particular about color or variety. Take care to buy from a reputable breeder or seller, because the healthier the guppies are when you buy them, the more likely it is that they will thrive. One way to do this is to ask other guppy owners where they buy their fish. Buy a pH test kit and aim to keep the water a neutral pH of 7.0, though it can range from 6.0 to 8.0. They prefer moderately hard water and a temperature of about 70 degrees. Guppies can handle many variations in water; the secret is to avoid rapid changes in water conditions. It helps to add one teaspoon of salt to the fresh water and to replace about 20 to 30 percent of the water weekly by removing the old water -- siphoning from the bottom to remove debris -- and replacing with an equal amount of fresh water. Like all guppies, fantails do best with a varied diet and feeding twice daily. Give them flake or pellet food daily and alternate live or frozen treats like brine shrimp or bloodworms. Feed live food later in the day so the guppies aren't as hungry and won't overeat them and become ill. Include live greens in the tank so they can munch on these as they wish. After she's 2 or 3 months old, a female fantail guppy will produce a new batch of babies roughly every 30 days. Each batch can include between 20 and 50 fish. A pregnant female should be put into her own tank a few days before she's due to give birth so the tiny babies won't be eaten by larger fish. Females can store sperm, which means they can produce several litters after mating only once. Guppies like to be in the company of other guppies. It's best to set up at least a 10-gallon aquarium so they have room to swim. Keep males and females in separate tanks unless you want to have babies. It's fairly easy to tell males and females apart. Females are larger, and males are more brightly colored. Guppies mix well with most other aquarium fish, except for bettas. Like most fish, though, guppies will eat tiny, newborn fish. 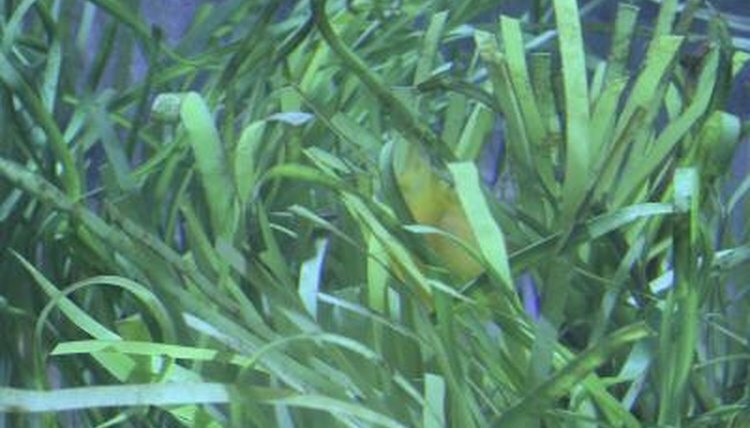 Give smaller fish places to hide, such as plants or cubbyholes, until they are large enough to not become fish food for larger fish. The hardy guppy doesn't succumb to many diseases, but sometimes they'll develop a whitish patch around the mouth, dorsal fin and base of the tail. Once this starts the fish has difficulty moving and usually dies. It's best to avoid this before it occurs, so if you continue to have guppy disease, consider changing your supplier.